There are few sights as charming as a flock of tiny spritely songbirds, chattering jays and other varieties of our feathered friends. Feeding birds encourages them to stay within visual contact, but there are bird seed types that may affect your prized plants. Use caution when purchasing wild bird seed to avoid excess waste, allelopathic effects and unwanted pests. A little knowledge will help prevent problems with bird seeds and ensure a trouble free ornithologist experience. Bird watching is a time honored tradition and puts the gardener more in touch with nature and its denizens. Erecting bird feeders enhances the garden and persuades different species of Aves to make your landscape their home. Unfortunately, birds are not the tidiest of eaters and even a catch tray under the feeder is often not effective to prevent the spread of debris. Purchase hull free food without sunflower seeds to minimize the damage. Many of us who have fed the birds may have noticed some ill effects to the plants below the feeders. Birds defecate onto plants, coating the leaves which can kill or diminish the health of the foliage. 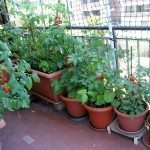 The waste from discarded hulls and food thrown around, encourage mold and unwanted pests. Weeds may spring up, as the seed in wild bird food is often still viable. 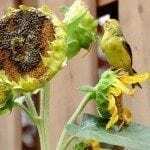 Other problems with bird seeds include an allelopathic effect found in sunflowers. Sunflower seed toxins can negatively affect other plants by the release of a chemical that repels competitive vegetation. Much of the toxin is in the shell itself, so purchasing seeds with just the kernels can minimize sunflower seed toxins and their damage. One of the most common bird feeder problems is from the waste the birds generate as they eat. Providing bird seed types that have no waste, such as shells or hulls, prevents molding debris and general mess. 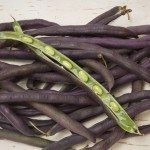 The entire portion of the seed is edible and will get eaten by either the birds or other animals who like seeds – such as rodents, raccoons, deer and even bears. This brings us to another issue, pests. There are repellents to try a reduce pest activity, or you can rake up any debris and dispose of it. Limiting the amount of refuse below the feeder is crucial to avoiding pest problems. Use a feeder with a broad tray that catches the bulk of the discarded seed. An obvious solution is to move the feeders to a location where there are no other plants below and a site that is easy to clean up after messy birds feed. A bare site under the feeder will give birds a chance to have a dirt bath, a site that is entertaining to the eye and necessary for many varieties of birds. You might consider spreading a tarp below to catch seed and make disposal easier. If all else fails, install shorter varieties of sunflower below the feeder. They are immune to their own alleopathy and will grow and provide habitat and cover for birds. As an added bonus, the season end mature heads provide free food for your feathered friends.